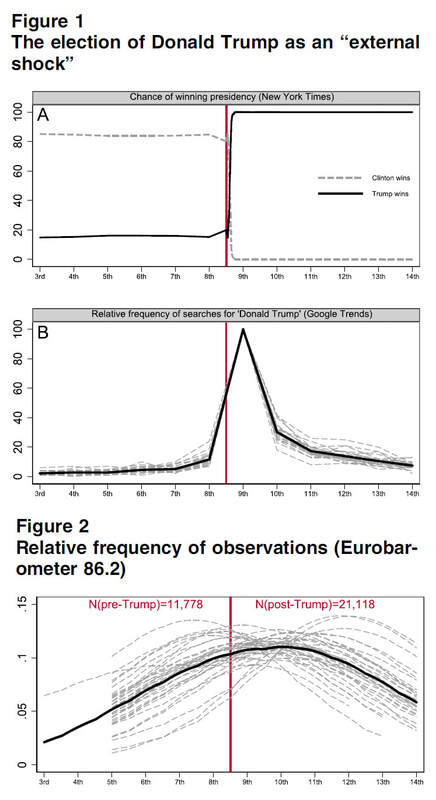 The article "A Trump Effect on the EU's Popularity? 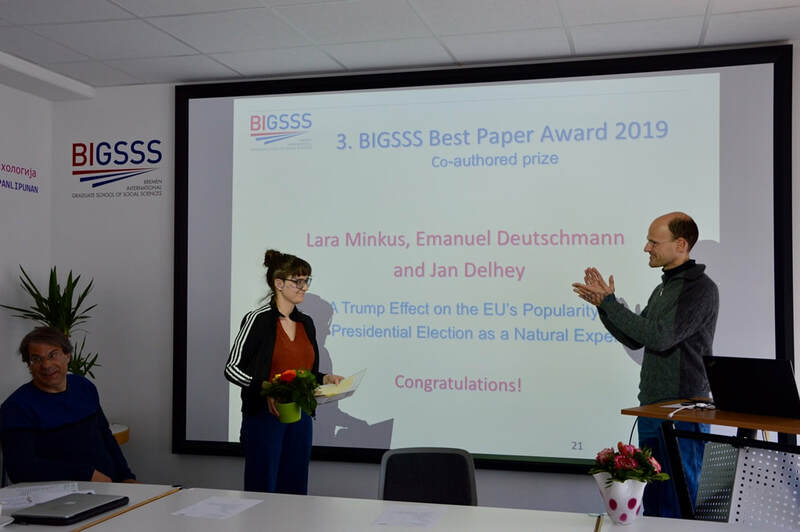 The U.S. Presidential Election as a Natural Experiment", published at Perspectives on Politics and co-authored with Lara Minkus and Jan Delhey, received this year's BIGSSS Best Co-Authored Paper Award from the Bremen International Graduate School of Social Sciences. The laudation was given by Professor Heiko Pleines. BIGSSS writes that the committee was "especially impressed with the societal relevance" and the "analytical clarity, explanatory value and empirical foundation" of the paper. The award is endowed with 500 Euros. On April 3, 2019, I was awarded the 1st prize of the OLB Science Award by the Oldenburgische Landesbank Foundation. The laudation was given by philosopher of science Professor Jürgen Mittelstraß in the Ehemalige Landtag in Oldenburg. 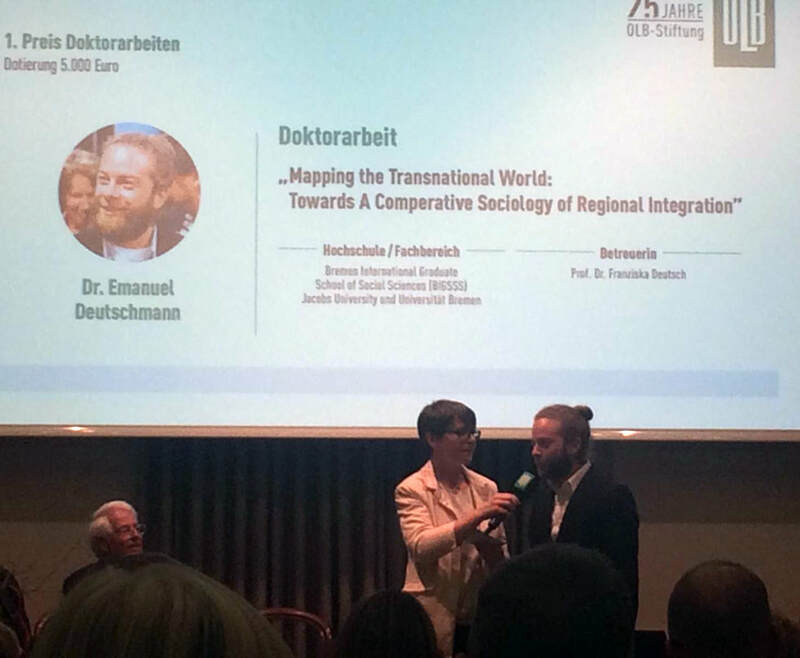 I received the award for my dissertation "Mapping the Transnational World: Towards A Comparative Sociology of Regional Integration", which I had defended in October 2017 at the Bremen International Graduate School of Social Sciences. In this dissertation, I analyzed the worldwide network structure of various types of cross-border mobility and communication. More information about the award can be found in this press release by Jacobs University and this short report in local Bremen newspaper Weser-Kurier (in German). The award was endowed with 5,000 Euros. I donated this sum to a non-profit organization that fights climate change, atmosfair.de. Atmosfair.de runs around 20 different projects in the Global South that help boost renewable energy and reduce CO₂ emissions. Positive "side effects" include the creation of jobs and health benefits for the local population. For example, they build solar energy plants in Ethiopia and Lesotho and hydropower plants in Honduras and Sri Lanka. A full list of projects and further information can be found here. With 5000 Euros, atmosfair.de can compensate 217 tons of CO₂, which is roughly equivalent to the annual emissions of 20 people in Germany. It can also, for instance, supply 272 Indian households with renewable energy. Please consider donating as well. On atmosfair.de you can calculate how much CO₂ your desired donation will offset. And get active and support movements like #FridaysForFuture and Ende Gelände. Global warming is the most severe problem of our time. There is no planet B!